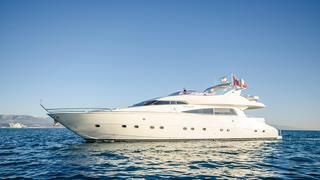 The 25.69 metre motor yacht Seraph has been sold with James Wood at Sunseeker France acting for both buyer and seller. Built in GRP by Italian yard Mochi Craft to a design by Nuvolari Lenard, Seraph was delivered in 1997 as one of the yard’s Mega 25 series. Accommodation is for eight guests in four cabins consisting of a full beam master suite amidships with a large double bed and a sofa opposite and an en suite bathroom finished in Italian marble, a double and two twins. All cabins are finished in mahogany with cream carpets and cream leather ceilings, and all have full en suite bathroom facilities. In addition, crew quarters are for four berths in two cabins with access to the engine room. The large saloon is bright and airy, finished in figured mahogany with cream carpets, and has an integrated galley and bar along with a dining area for eight guests leading forward to a comprehensive internal helm station. Outdoor areas include a generous aft deck with built in upholstered seating and a table for casual alfresco dining while up on the flybridge are sunbathing spaces and a Jacuzzi tub, protected from the sun by a sliding Bimini top. Extras included in the sale are satellite television sets in the main saloon and master bedroom plus a Novurania 430 tender with a 60hp Yamaha outboard motor. Twin 1,850hp MTU engines linked to Hamilton water jets give her a cruising speed of 22 knots.